At the heart of Avista is the Spokane River. And at the heart of the Spokane River is Huntington Park. The park is named after David L. Huntington, Washington Water Power's third president, 1910 to 1927. Huntington led WWP during a time of unprecedented expansion. He is an example of Avista’s proud legacy of innovation and service. Avista redeveloped this park to give residents and visitors a close-up look at the awesome power of this great river. Located on the south bank of the Spokane River, within the shadow of the original Washington Water Power Post Street substation and the spray zone of the Lower Falls, Huntington Park is a legacy to the city and leadership that made Avista what it is today. Take a virtual tour of Huntington Park. Located just north of Spokane’s City Hall on Post Street, the Spokane Tribal Gathering Place connects Riverfront Park with Huntington Park, a revitalized public space showcasing the powerful Spokane River Falls. 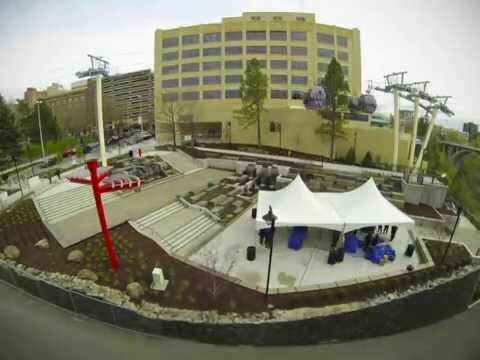 Avista developed the Gathering Place as a gift to Spokane in celebration of the company’s 125 years and long-standing partnership with the people of Spokane. The space invites people to enjoy the river in new ways and provides a great venue for community events. As part of Avista's commitment to the community, the company has installed interpretive signage to inform viewers of the history and natural resources of the Spokane River falls and enhance each visitor's experience. Until you can experience Huntington Park and the Gathering Place for yourself, learn more about this work through the videos and signage examples shown on this page.